Over its last one hundred years, the State steadily devalued the currency by 98%. The high cost of government—particularly, growing entitlements and perpetual warfare, coupled with a diminished number of taxpayers, led the government to massive debt, to the point that it could not be repaid. Those citizens that were productive began to exit the country, finding new homes in countries that were not quite so sophisticated but offered better prospects for the future. The decline in the value of the currency resulted in ever-increasing prices of goods, so much so that the purchase of them became a hardship to the people. By governmental edict, wage and price controls were established, forcing rises in wages whilst capping the amount that vendors could charge for goods. The result was that vendors offered fewer and fewer goods for sale, as the profit had been eliminated. If the reader is a citizen of the EU or US, the above history may seem quite familiar, with the one exception that strict wage and price controls have not (yet) been implemented. Still, the history is accurate; it is the history of Rome. 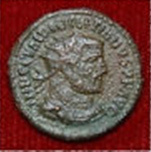 The Roman denarius pictured above features the profile of the emperor Diocletian, circa 301 AD, at the time when he issued the edict mentioned above. Like the US dollar that followed 1700 years later, the denarius was the most recognised and most respected currency of its day, as it was almost 100% silver. However, it was steadily devalued by successive emperors during the Era of Inflation from 193 to 293 AD. This was done by diminishing the amount of silver in the coin until it was made entirely of base metal, with a thin silver wash. Just as the US Federal Reserve devalued the US dollar 98% between 1913 and 2013, Rome devalued the denarius over a similar period of time. Still, there will be those who will claim that, as the dollar is the world's default currency, it must regain its former strength. I'm afraid not. In 193 AD, the denarius enjoyed a similar position to that of the US dollar today. Yet, having been devalued, it never regained its worth—in fact, not to this very day, even as a relic. The denarius pictured above was recently offered on eBay for the 'Buy Now' price of $28.80. Not a very impressive increase in value for a coin that has survived for 1700 years. We would like to think that, even though some current governments are following the Roman road to ruin with remarkable similarity, the outcome will somehow be brighter—that we will not witness the Fall of the Empire in our modern world. Surely, this time around, political leaders will 'do the right thing,' and place their own personal ambitions below the need to salvage the mess that they have created. The pattern has existed for over 2000 years, and historically, empires have followed the pattern to ruin with extraordinary consistency, regardless of warnings. But before we finish here, the observant reader may point out that his country has not instituted wage and price controls, as in ancient Rome, and that the present Empire may therefore not experience the predictable collapse that such controls would bring about. In considering this question, it would be helpful to look at Venezuela and Argentina, two countries that are following a path very similar to the EU and the US, but happen to be a bit further along in the pattern. They have, in fact, instituted such controls, with the result that their economies are nearing collapse. Still, in a last ditch effort to avoid realising the inevitable, we may argue that Venezuela and Argentina are third world countries, and therefore we might still expect a more positive outcome. Not so, unfortunately. The US has also trod this ground before. The Smoot-Hawley Tariff of 1930, a last ditch effort by the US to stave off depression, triggered similar tariffs in Europe, assuring a deeper depression on both sides of the Atlantic. An ever-greater number of people are coming to the realisation that the EU and US have become runaway trains, trains that are headed for a cliff. More troubling, the firemen are clearly shovelling the coal into the engine at an alarming rate, speeding up the train rather than slowing it. Most of us would prefer not to acknowledge that the train is headed for the cliff. This is understandable, as no one relishes the idea of jumping off a moving train. It's not a pleasant choice to have to make. The reader may consider whether jumping off the train now may be preferable to the alternative.